Akron is the pretty clear favorite. Biggest question there is how their bigs will hold up with games three straight days and C Pat Forsythe done for the season. Still, with how they've been shooting from deep, that may not matter. From crowd standpoint, this sets up nicely for well attended tournament. 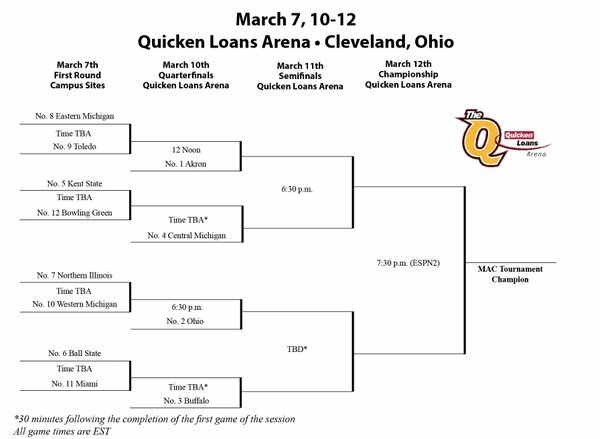 Ideal semi-finals there would be #1 Akron v #5 Kent and #2 Ohio v #3 Buffalo. The Q would be ROCKING if that plays out. Has this ever drawn enough crowd to make the place "Rock?" Not questioning, just asking the question. Yes. Every year Ohio, Akron and Kent are there together for semis it is a loud crowd. Semis are better than finals. 4 teams rather than 2. It helps that it is St Patrick's Day weekend in Cleveland. The city already has party atmosphere. If you are MAC fan and have not had chance to visit MAC Tournament, I highly recommend it. Pretty great atmosphere. Much, much, much better than football championship in Detroit. Definitely the best run mid-major conference tournament in the country. The place always looks full and loud. Agree with the above posts. The MAC tourney in Cleveland has always been a quality event. Good shooting night for Ohio. Campbell goes 21 with 8 boards and five blocks. Congrats to my Mom's alma mater, the Bulls, on a clutch performance, MAC Championship, and NCAA berth! Wonder how much the "Q was rocking" after Blake Hamilton made that game winning 3 with seconds remaining??? Was your mom happy when you went upstairs to congratulate her, and maybe asked her to make you a sammich? Akron blew it again it normal, congrat to buffalo. For whatever reason they laid an egg attendance-wise this year. Akron and Ohio both are the 2 largest draws, and Buffalo usually travels well. maybe the weather was too nice to be inside ?